Mother-of-pearl furniture of this kind, using the contrasting black lac to enhance the designs, was exported from Western India to Europe, Ottoman Turkey and elsewhere. 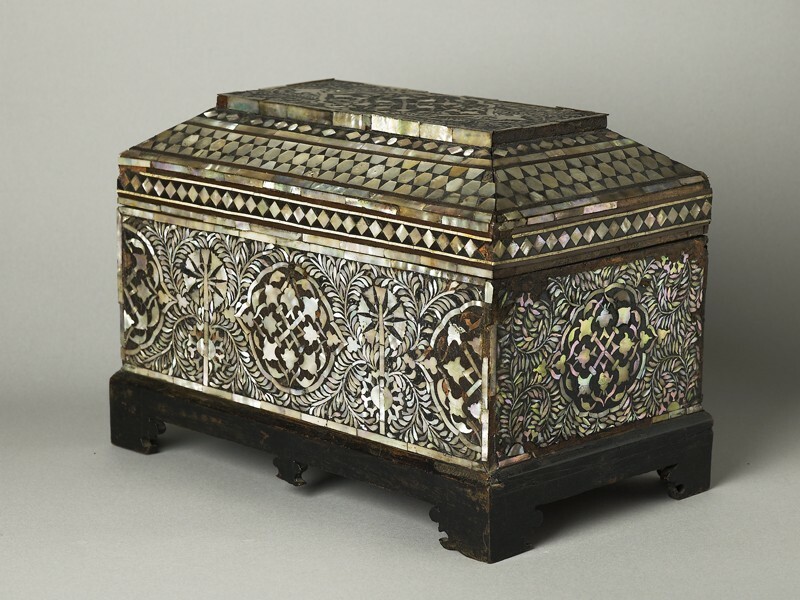 Combining Islamic geometric designs with its Indian palm-tree and leafy frond decoration, this casket may have been made for the Turkish market. Purchased with the assistance of the Friends of the Ashmolean Museum, 1980. The production of wooden furniture decorated with overlaid pieces of iridescent mother-of-pearl set in dark lac was an important luxury handicraft of Western India in the 16th and 17th centuries. Examples of the technique survive in India in the cenotaph canopies at three tombs of Sufi Shaikhs, two of them at Ahmedabad and the other in the shrine of Nitzām ud-Dīn Auliyā’ at Delhi. However much of the production was intended for export to foreign markets, including Ottoman Turkey and Europe. The approximately thirty surviving examples include a throne, a book-rest, pen-boxes, writing chests and a number of caskets with bevelled lids. One of the latter, in Dresden, has an inventory date of 1602 and displays a very similar spade-shaped tree device to the present casket, which in spite of a slight coarseness in its decoration can therefore be dated to just before 1600. Its sides are decorated with medallions containing stylised interlaced foliate decoration, interspersed with palm tress and leafy fronds. 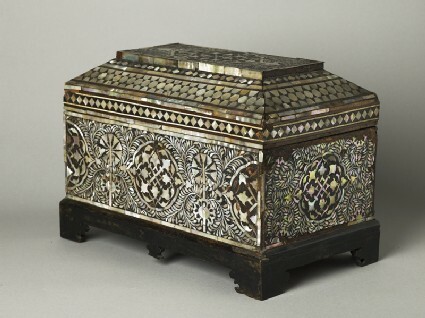 The flat surface of the lid is executed in a similar style, but its sloping sides have geometric ornament of repeated hexagons and diamonds characteristic of Ottoman work, and it has been suggested that the casket was probably made for the Ottoman market. The chinoiserie base is a later replacement.